Ikelite Dual Arm Underwater Camera Tray Each handle is 5” tall. The tray is 12” long. The base is 1 3/4” wide. 4 1/8” max opening from screw center to screw center. This tray has been used around 80 times in dives around the world so it has several scratches, but it is in perfect working order. Ikelite Underwater Camera Tray - Dual Arm - EXCELLENT CONDITION - Must See!!!!! There are no dings or scrapes at all. Not sure what it is for. Condition: Excellent! (See Photos). Used Nikonos Tray for Ikelite strobes. Includes arm, cable and tray. A dual tray designed to combine the AF35 strobe kit with a secondary lighting accessory. A sleek new hard-anodized aluminum design provides increased strength and more mounting options compared to the original AF35 dual tray. Overview Ikelite - IK-9523.63 - Tray with Single Handle. IK-9523.63 - Ikelite - Tray with Single Handle. 1 x Mounting hardware for Ikelite housings. Part Type: Tray. 1 x Left handle. Top Product Features. Ikelite - Tray with Dual Release Handles Ikelite - IK-9523.64 - Tray with Dual Release Handles. Ikelite Tray with Dual Release Handles 9523.64 - New Style for 2015. This anodized aluminum mounting plate attaches to Ikelite housings and also features a standard 1/4-20 tripod mount for attaching to Flex-Connect Trays. Includes two 12-24 type stainless steel mounting bolts and a hex-wrench for quick assembly. GoPro not included and not available through Ikelite. Add a pistol grip to your Steady Tray for GoPro for increased comfort and stability. Durable ABS handle with soft-touch rubberized overmold. Slightly angled for improved ergonomics. We are not professional in any particular field. If it is not in the photo is it not included. See photos below. The Ikelite housing and tray were only use 3X and are in excellent condition. The tray is also suitable for olympus Pen housing, PT-EP01, PT-E05, PT-E06, Fisheye Fix housings, RecSea housings with two threaded holes in the housing. If your housing only has one threaded hole then you need the TR-D tray. Also included for each ball is the mounting bolt and knob. Dive Lights. An included diffuser attaches to the front of the Gamma for a smooth, even illumination of your photos and video. Fiber Optic Cables & Sync Cord. The Gamma light can also be used above water, making it great for shots of flowers and insects, and to keep in your hiking or camping kit. Ikelite Featherweight Single Tray with Flex Mount 9523.41 ABS construction provides the perfect balance of strength and weight for almost any compact digital camera system. Recommended for the attachment of external lighting accessories to any Ikelite 6200-Series ULTRAcompact Housing. Hardware is also included to mount to most non-Ikelite housings featuring a central 1/4-20 tripod mount for compact digital cameras from Olympus, Panasonic, Sony, and other manufacturers. The included 3/4 in Flex Mount and 4 Piece Flex Extension are compatible with any components from our 3/4 in Flex system. The 3/4 in Flex system is ideal for lighting accessories and doubles as a handle grip. Ikelite Steady Tray for GoPro Kit with Handles 2602.4 The Steady Tray for GoPro is now available as a complete kit in its most popular configuration with all three handles. Each handle can easily be added or removed with a screwdriver for travel or to change your set-up in between dives. Left and right-hand quick release handles provide a soft, over-molded grip and attachment points for lighting accessories. A bottom-mounted pistol grip is perfect for in-motion, action video. In the Box Steady Tray for GoPro # 2601.03 Left-Hand Quick Release Handle # 9531.3 Right-Hand Quick Release Handle # 9531.4 Pistol Grip for Steady Tray # 2601.11. Ikelite Compact Video Tray for Ikelite Pro-V8 Video Light This Compact Video Tray is "L" shaped and accepts an Ikelite Pro-V8 or any light attached to an Ikelite Pop Bead flex arm. Recommended for Ikelite Compact Video housings. Ikelite Underwater TTL Substrobe MV W/Tray, Arm & Case. Papers & Accessories. Substrobe MV. Ikelite tray and arm complete. 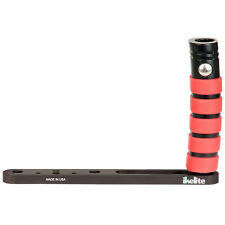 Ikelite flashlight. Sync cord from Ikelite to Nikonos 5-pins connector. IN USED CONDITION FOR USERS ONLY. This anodized aluminum mounting plate attaches to Ikelite housings and also features a standard 1/4-20 tripod mount for attaching to Flex-Connect Trays. The Sealife Tray Adapter for Ikelite Housings includes two stainless steel mounting bolts and a hex-wrench for quick assembly. Compact Video Tray with Pro V8/LocLine Mount. It produces great shots! It's in excellent condition! I've taken great care of this system. Happy Diving!